The new aspect of the iPhone 5's display shows more of the photos in fullscreen, without the need to crop them. Colors look better, the image is sharper and zooming in and out is much faster. Marking photos is pretty much the same affair as before. 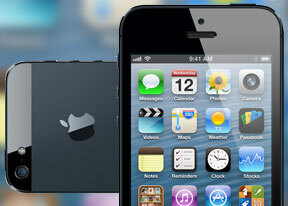 With iOS 6 you can share photos directly to Facebook from the Photo gallery. You can also arrange the photos in albums. The photo editor enables rotation, cropping, and red-eye removal. There's also an option called Enhance over which you have no control - it's all automatic and usually, the results are surprisingly good. In Edit mode four keys appear at the bottom for the available editing options. Watching 16:9 aspect movies is a more enjoyable experience now on the iPhone 5 since its 4" screen has shifted to the popular aspect. 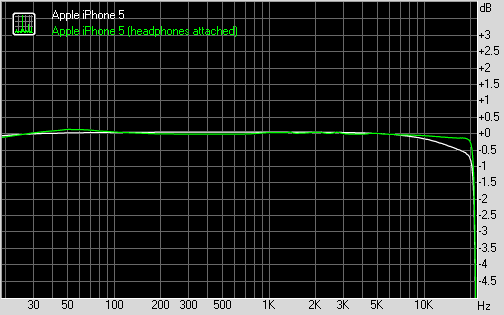 Surpringly enough, the iPhone 5 audio output was a tad worse than that of the iPhone 4S. Obviously the ultra compact body demanded some compromises be made. The good news is that even though the iPhone 5 fails to match the performance of its predecessor, it still remains one of the best performers on the market. In the first trial (connected to an active external amplifier), the iPhone 5 did quite well, though not quite perfectly. The frequency response has some deviations at the high end of the spectrum and the stereo crosstalk levels are only average for this part of the test. Neither of these is anything to worry about, but it's not quite what we've come to expect from Apple. Volume levels on the iPhone 5, even though lower than those of the 4S, are still well above average. The second part of our test told a similar story - the iPhone 5 is a great performer, but not quite as good as the iPhone 4S. It had higher intermodulation distortion levels, more stereo crosstalk and lower volume levels. So while last year Apple's flagship smartphone did easy work of the competition, the iPhone 5 got the victory by the skin of its teeth.